Maybe its the soothing sound and sights of the water, maybe its being in contact with nature, maybe its the stillness of it all, but when we go kayaking, my mind seems fill up with all kinds of thoughts. This weekend was no exception, I was having such a wonderful time. It was thrilling to be back in the boat after the winter. The temperature was perfect, the water was wonderful, only one other boater was out on the water when we started -- we had the river basically to ourselves. It was perfect and it was fun. 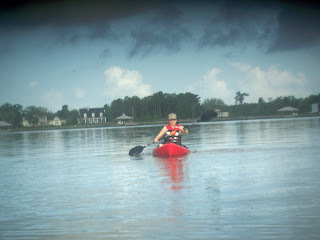 Coming back, it was warmer and much harder to paddle against the current. There were more boaters out on the water and we had to watch carefully for them. With their motors, they can look far away one minute and be upon you the next, so we had to keep our eyes open for them all the time. It struck me how kayaking is fun...and work. You can't get out on the water without paddling, and sometimes that paddling is hard. Crossing the river this weekend was tough. I tried to really push myself hard and cross it quickly. My heart rate was up and I was sweating once I got to the shore. While it was enjoyable, it was definitely work. Now the kayaking stroke is different than you would think. You don't really pull hard with your shoulders. You plant the paddle in the water and use your core muscles to pull the boat past the paddle, and you let the boat float past. You have to work with the paddle and with the boat and know what each of them has to do to make the three of you work efficiently and safely. There is a similar principle at work in our Christian life. As Christians, our lives are enjoyable, fun and yes, work. We can't just sit back passively and expect the Lord to run over us in our lives. We can't aggressively run ahead of the Lord and work independently of Him either. We must know how the Lord works, how He works in and through us. We must depend upon Him for all things, but we must realize that we, too, have a place in the work. The Lord Jesus was our perfect example in this. He often said that He did nothing without the Father. This too, is the dynamic for our Christian life. He works in and through us. He works and we work. I push the paddle, it moves the water and the boat floats by. It is a family working.